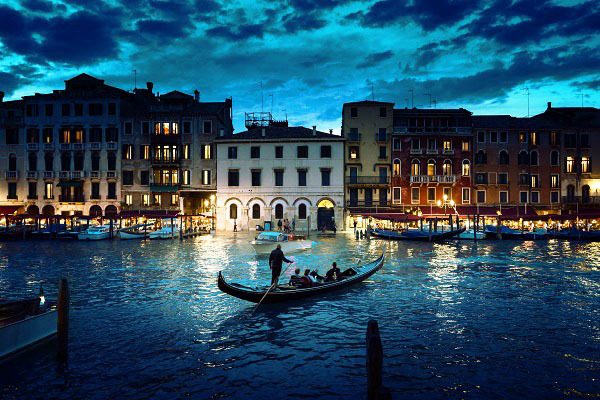 Venice – with its origins during the Middle Ages and Renaissance – is located in the North East of Italy. Built on 118 small islands and characterized by its canals and bridges, it can hardly be surpassed in its romance: once you have seen all the small alleys, antique Palazzi, impressive bridges and in particular the beautiful canals that are famous worldwide, you will immediately fall in love with Venice! Sailing in a gondola to discover the charming city of Venice will only be one highlight of your visit in Italy’s most romantic city and there are so many amazing places whose beauty you will never forget. So what could a city which is so much full of romance be better for than a marriage? Be it a protestant, catholic or civil wedding– Venice offers the most beautiful wedding venues you could imagine. A civil wedding for instance usually takes place in Palazzo Cavalli, a Renaissance building which is located in one of the most picturesque areas of the city. The rooms inside the Palazzo are elegantly furnished and offer a great view to the Grand Canal which is close to the Rialto Bridge. Apart from Palazzo Cavalli, there are also a number of other charming antique locations just perfect for a romantic civil wedding in Venice. If you decide to get married in Venice, our Perfect Wedding Italy team will be happy to support you all the way through the planning of your marriage. Apart from booking transfers and hotel accommodations we can help you searching a wedding venue that perfectly suits your requests, planning the ceremony and wedding reception, settling all the necessary formalities and arranging everything for you in advance. Moreover we offer professional photographers and musicians, support you with the selection of your bridal bouquet and wedding decoration or anything else that you wish for your unique wedding day. Citizens from the United States and Australia must submit a sworn statement made at the American or Australian Consulate in Italy subsequently legalized in Prefecture Office in Italy. Moreover they need the attested affidavit made at the Italian Consulate in the United States or Australia. For more information about a wedding in Venice and a tailor made offer, please contact our Perfect Wedding Italy wedding planner.